When I signed up for my first 10K, I was admittedly very nervous. I'd just started running in earnest in August, and suddenly I was running a 10K just a few short months later. However, after making it through the Couch to 5K program and having completed several 5Ks at increasingly impressive paces, I knew I was ready. The date I figured to be done with the 5 to 10K program coincided with the North Shore Cupid's Love Dash (February 10, 2013), and I signed up. 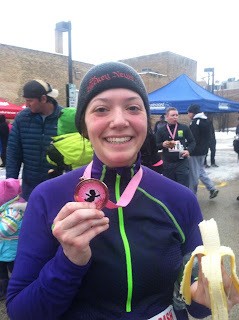 It was a fun, cute concept -- a Valentine's Day weekend race with a sweet theme. Runners could choose to run "solo" or in teams with a significant other or friend. In addition to the usual hydration stations, the course also featured candy stations, which featured volunteers with buckets of candy offering treats to runners as they passed. I arrived to Highland Park a tad later than I'd intended, only a few minutes before the race start. Parking in Highland Park is not exactly a pleasant experience, and I was scrambling to find a spot before the race started without me. But once I found a spot, I got to the start line with enough time to exchange my race swag bag t-shirt for a better size, hand my car keys off to my boyfriend, who'd come to cheer me on, and get myself situated at the starting line. At the starting gun, I was overloading on adrenaline as usual, and it was a good thing, because it was at that very second that the freezing rain that had been forecasted for the day began to fall. Despite the weather, the course was great. It was not too hilly, and provided some great eye candy: the most expensive homes on the North Shore and the Ravinia grounds. The only issue I found was that in some sections, roads were not blocked off and there were no sidewalks, so I got very nervous with cars passing by runners in both directions. It particularly got nerve-wracking near a church, as runners were having to dodge cars turning into the church parking lot, which was experiencing a lot of traffic being that it was a Sunday morning. There was also one very icy patch of road in Mile 5. Based on a Facebook post from Carpe Diem Racing following the race, they evidently were not permitted by the city to sand or salt the roads, so it was not the fault of the organizers, but it was a concern, especially when a runner right in front of me wiped out rather spectacularly on the ice and everyone had to slow their pace pretty considerably to avoid the same fate on the slick road. However, once I came through the ice patch, the finish line loomed, and I struggled to put on the best burst of speed I could muster. I finished in 57:43, better than I had even imagined (my official finisher photo shows that I was actually smiling). I was presented with the adorable finisher's medal as I crossed the finish, and I was thankful to have only a few steps to walk to grab a water, banana, and a Muscle Milk. My boyfriend snagged this photo as I ate my banana and held up my medal. It was a great race overall. Not only did I get the confidence knowing that I could run a 10K in that kind of time just months after taking up running, but I also appreciated the great organization and small entry size of the race. I'd definitely run the Love Dash again next year -- but hopefully freezing rain won't be in the forecast again!